I had never been bitten by a cat before I started volunteering at a cat shelter last summer. I’d been nipped at, sure, but never to the point of broken skin. However, none of the cats who bit me meant to do me harm — which is an important thing to remember in my position of continuing to care for them, even with fresh wounds. All those cat bites were from kitties who had simply gotten overstimulated. They’re living in an environment with the ever-changing sounds and smells of 130 other cats, so it’s easy to see how cat bites happen. 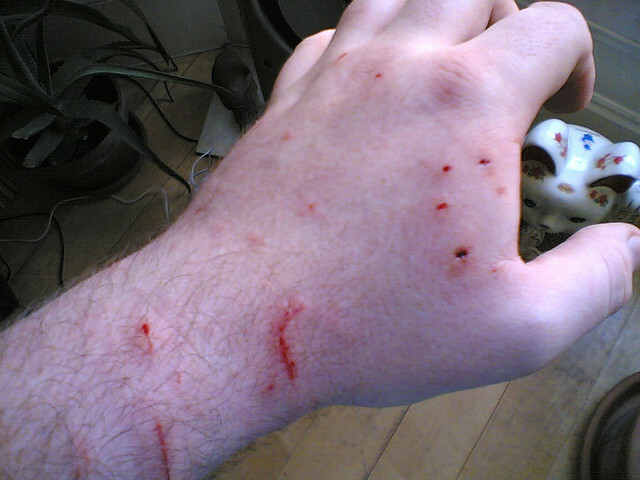 Cat bites on a hand. Photography courtesy Andee Bingham. The first cat to bite me was Miles, an enormous black beauty who had been caged for health issues. While cleaning his cage, he was rubbing against my hands and headbutting my elbows. He was new to my area of the shelter, and I was excited to have some good bonding time with him. Then, behind me, there was a scuffle between two free-roaming cats. I turned my head to see what all the fuss was about, and Miles bit me on the back of my neck. This bite was mild; he barely broke the surface of my skin. It was more of a deep scrape, really. Still, it startled me, and, of course, OUCH! When Miles bit me, I didn’t know anything about cat bites. And because that cat bite didn’t get infected, I stayed oblivious about cat bites for a while. Then, about a week later, Rigel bit me. I was scratching him on his sweet orange-spotted head, behind his ears. He was loving it, loving it, loving it, until he didn’t love it anymore and sunk his teeth into my hand like a snake would. One tooth went into the palm-side of my hand, at the base of my thumb, and another tooth punctured a similar spot on the other side of my thumb. I knew it was bad the second it happened, as pain shot up my arm and made my hand throb. My instinct with the cat bite was to wash it, smear it with an antibiotic ointment, and bandage it up. This cat bite wound might be infected. Always see a medical professional if you suspect your cat bite wound is infected. Photography courtesy Andee Bingham. I wasn’t concerned about the cat bite until the next day, when I removed the bandage. What I found was that the base of my thumb was a bit swollen (nothing too dramatic, but certainly noticeable), the area was pink, warm to the touch and painful. As a freelancer who often struggles to eat, let alone see a doctor, I don’t have health insurance (I play emergency-roulette every time I leave my apartment). I kept the punctures clean and smeared with a triple-antibiotic ointment, and I changed the bandages twice per day — keeping a close eye on the brewing cat bite infection to make sure it didn’t get worse. After a few days the swelling went down, the redness receded and the area became less tender. I was lucky. Quinn says that deep-puncture wounds from cat bites might bleed, and that you should apply pressure to stop the bleeding, then apply a clean bandage. She also recommends visiting urgent care or an emergency room. 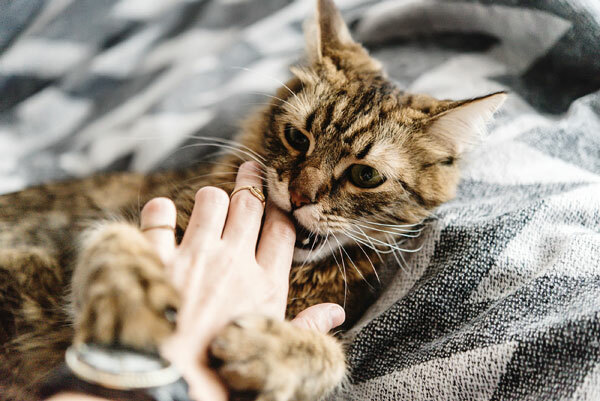 Cat bites are exceptionally dangerous and prone to infection because a cat’s needle-like teeth can push bacteria deep into flesh, tendons and joints. The small but deep puncture wounds are hard to thoroughly clean and tend to trap bacteria inside, where it quickly spreads. According to Quinn, cat bites that are infected will be red and painful, and might have some drainage. You might see bumps or blisters. Late stages of infections from cat bites might result in fever, weakness, swollen lymph nodes, headache and a general feeling of being unwell. What are the signals that a cat might bite? This cat is showing signs of aggression, which means he might bite. Photography by Alun Marchant / Shutterstock. 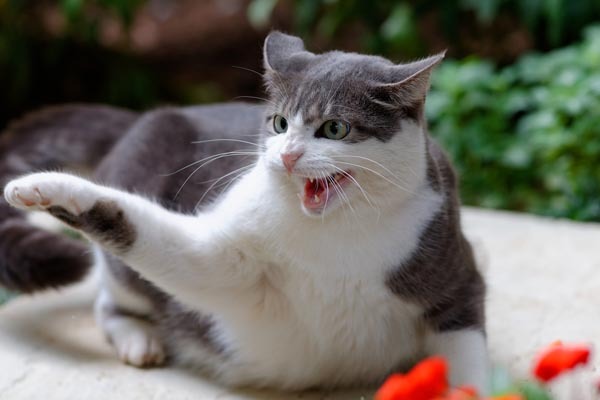 It’s not uncommon for cats to get overstimulated during play and lash out from excitement (though it is rarer for a family cat to lash out in a way that breaks skin). In nonplayful situations, though, there are some signals you should heed. Remember that cats don’t inflict injury based on whether or not they “like” the person they injure, and their behavior shouldn’t be taken personally. When it comes to cat bites, they’re simply acting in self-preservation, striking if they feel threatened. Tell us: Have you ever had a rough run-in with a cat or dealt with cat bites? What about cat bite infections? Tell us about it in the comments. Thumbnail: Photography by Bogdan Sonjachnyj / Shutterstock. I hope you were able to take care of your wound. It’s been a few days so if it’s showing any sign of infection you should see a doctor. If not then you’ll probably be fine. One of my cats bit me a few weeks ago. It’s still a bit sore which is why I was looking up information about cat bites. However, I did see a doctor for another reason and they looked at the bite and said it wasn’t infected and not to worry. I guess I should figure that even with a small bite my finger took damage so it’s going to hurt a bit now and then. Hi my kitten bite me , a small bite but make me scared. What should I do now? Yes, I’m on day 2 in the hospital for a cat bite to my hand. My kitty is indoor only and vaccinated. Leaving to go to work and he bolted out the door when he saw the neighborhood cat. He never caught up to the other cat but was still pretty agitated when I scooped him up…bit me in my hand…deep puncture wounds that quickly became infected. I waited 24 hours to go to ER. I had no idea all the things that could happen. SO eye opening. Luckily I don’t need surgery. 48 hours of antibiotics thru pills and I.v. I can leave tomorrow. I still love my cat. My son and I rescued a feral kitten from a van’s engine. After 20mins on his back under the van, he handed the kitten out. She seemed calm, considering, so I scooped her up. She proceeded to Chomp into the tip of my index finger over and over. When I was finally able to get my finger out of her mouth, we bundled her into a shirt and she calmed right down. We washed of my finger and squeezed it to make it bleed to flush out as much as possible. All in all, 20 holes in the tip of my finger. It got a little temp but I soaked it in hydrogen peroxide and kept it medicated and covered. All better now. ???? my cat bit me on my leg (my cat has rabies vaccine). Its have been 6 days and its still hurts. the area still swollen red and purple. what should I do ? wound closed up but the skin around it still swollen. how do I treat it? I used just leave it and it would go away in a few days but this bite doesn’t. Definitely go to the doc immediately. As it was described to me- cats teeth are like needles and taper off. Even though the surface may be healed up, the puncture wounds may still exist under and be infected. My cat, adopted by me as a “senior”, often bites me when I have been petting her and then I stop. It’s usually just a nip that doesn’t break the skin, but there have been times when she has given me a good hard, blood-drawing chomp. She is extremely sociable and affectionate, and immediately approaches visitors, asking to be petted. She has never been aggressive with me or guests, but I wonder about the “love bites” she gives me. How unusual is this kind of behavior? On a cat bite that may even be just a nip, it is important to clean and care for the wound as Catster stated. Let me add that even the smallest nip is important. That said one needs to moniter your bit area and swelling….. Should you find that you are observing red streaks coming from the bit area and extending up the arm , one should immediately see your Dr. This is an indication that your infection is not being controlled and starting to move through your body. It is important to address and stop the infection prior to moving into the chest/ heart area which can be extremely dangerous to you. Many years ago my cat had to have emergency surgery for chronic bladder blockage. When I took him home on a Saturday, they forgot to send pain meds and I stupidly thought he had had some at the vet and would be all right. The next morning when I went to feed him and clean his cage, he was out of his mind in pain and attacked the first thing he could–my finger. I luckily had my vet’s home number and got her to meet me at the vet’s office which was closed because of the weekend. She took one look at my hand and said go straight to the ER–now! I am thankful for that because my only concern at the moment was my cat and not myself. I went back home, gave him some pain meds and headed to the ER–by that time it was over double in size. They took me in and immediately went to some deep cleaning which required sticking a needle filled with solution into the wounds to flush them out. Long story short, I spent the entire day there and this is pain I would never wish oh my worst enemy. The swelling was unbelievable. I couldn’t bend the finger easily for weeks and still had pain a yr later. Cat bites are serious. 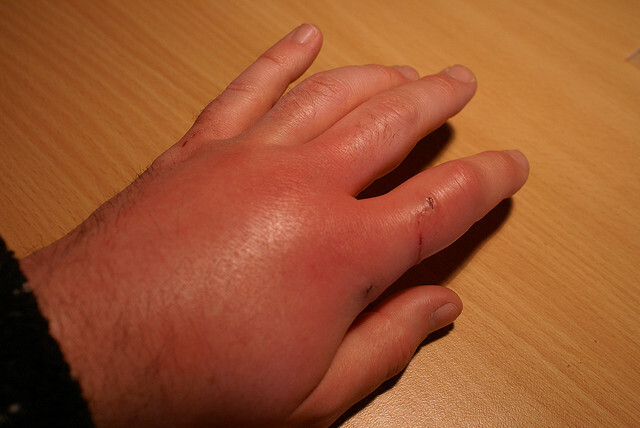 If you get bitten, do not wait and see how it goes–it is easier to treat and you will have better results if you go ASAP. I have my Tootsie, last Nov. Today is his 4th month old. I always lock him in his cage every night. He always toyed (bite & bite) my dog they are always together when his out of he cage. I was bitten maybe morethan 3 times. I just wash it and clean with alcohol.so far the scratches healed. I do know if i need to see a doctor and got shot. (Never tried) i hope my cat will learn how to not bite. I think i need to change the way i treated him when he was aggressive. Or maybe he was thinking all people in the house was like my dog.. i dont know. Please be aware at only four months old, you have an energetic KITTEN that wants to play, play, play. If you spend a lot of time playing with your kitten and burning energy, there will be less chance of it biting. But that is how they play fight with their siblings, so it is instinctual. Don’t play with your hands, it only thinks your hand is “bait” then. Play with dangly toys on a string. I’m curious as to why you lock it in a carrier at night? Cats love to stroll around the house at night! I rescued a litter of motherless kittens (5) from my neighborhood a couple of years ago. I already had 2 dogs who were not cat friendly. I used large dog crates for them as a tool for getting the dogs used to them and to learn to accept them. At first I only let the cats out after I secured the dogs in another room. The cats would get a couple of hours out at a time during the day. Eventually after about 3 months I was able to let everybody be free in the house with supervision but at night the kittens slept in their cages. I continued to cage them at night until they were almost 2 years old at which point I decided that the dogs had fully accepted the cats and it was safe to eliminate the cages entirely. Cages can be invaluable training tools and provide safety. They just need to be used appropriately and never over used. Always remember cats are not dogs and should be treated totally different. And, cats are nocturnal and locking them in a cage at night will just promote their anxiety as this is the time they love to explore and play most. Check with Jackson Galaxy from Animal Planet as he is a wonderful cat behaviorist ans has taught me so much about the species. Today february 1,2019 i take him in for shower when finish i let him dry with cloth, and suddenly he bite me in my hand, it’s too hard and the wound is verry deepand bleeding. So run and wash it in the faucets and go directly to emergency and i got shut of anti rabies. WHY would you take your cat in the SHOWER with you?? We got two barn kittens, I could hold them both in one hand. They spent most of the winter in the garage, and came in the house almost daily for cuddling. They are so big now they can hardly both sit in my lap at one time. We took them to the vet for spay and neutering. The Tom has now bitten me twice. Always sitting in my lap purring while I pet and scratch him. I think he likes being close, but think I need to wear long sleeves when holding him. He has funny markings and looks like a BobCat with a long tail, he even walks/runs like a wild cat. What are the odds he’s a mix? We suggest taking your cat to a vet to get the best sense of the breeds / mix of breeds. Thanks for caring for these kitties! I was “Adopted” by a Feral Cat; I took him to the Vet, got all his shots (He was fixed) to the tune of $280.00 ;Usually cuddly , he comes and goes as he pleases Gets into scraps with other feral cats, sleeps on my lap by the TV and cuddles on the bed at night, again coming and gong. Fun for two years-I think he’s about three. The past few weeks, though, he has become aggressive from time to time. Gave me a nasty bite three weeks ago, than last week suddenly chomped down on my hand making me bleed profusely. Happily no infection. Another attempt last night-though he missed. SO I’ve put him out of the house-Three times is NOT a “Charm”, and I can’t risk infection. Really sad, but …….? Woundcare treatment of cat bites are need to be taken seriously as these felines have bacteria which can cause serious health issues. Thanks a lot for sharing this blog. I had been nipped by cats before, but never experienced the pain of true bites until I began fostering this year. The pain from a cat biting through muscles and tendons is indescribable! I’ve been lucky so far with no infections, but stupidly put my bare foot between fighting cats today and got a nice bite on my big toe joint! Ouch! The throbbing pain is worse than labor! How long was this pain? I’ve just got out of hospital today after a 2 night stay from a cat bite to my hand. I stupidly picked my cat up when he was having a fight to stop him hurting my neighbours cat! I never realised how serious a cat bite could be! Antibiotics by IV for 2 days and luckily escaped an operation! Very scary times! My poor cats are happy to have me home and I feel sad for leaving them for 2 days ???? Our cat has bitten me twice, the first time I washed the wound and put thieves oil on it, it never got infected. She did it again today but worse, I have done the same hoping for no infection. She is an indoor only cat. Our 4 year old Siamese will occasionally (seems to happen about once a year) bite me aggressively on the bottom of my bare foot, causing puncture wounds. It’s always a complete surprise and happens while I’m just on the floor stretching or on the couch with my foot near the edge. I really wish I could figure out why she does this.